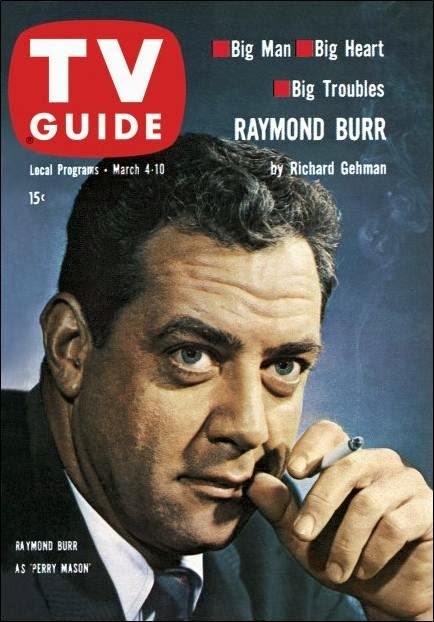 Raymond Burr was on the cover of TV Guide at least a dozen times, between Perry Mason and Ironside, not to mention his turn as Pope John XXIII. There's very little new to be written about him, and we know that much of what we've already read will turn out not to be true. There are a couple of things that remain consistent through all these stories, however: that Ray Burr is a very private man, and that he's a mensch to work with. Richard Gehman's profile of Burr this week alludes to his life as "one long series of heartbreaking tragedies," most of which didn't actually happen, but there's a significant line in this section, in which Gehman remarks that "few of Burr's friends know anything about him." It's likely that, in retrospect, what they did know of him might not have been so. Lest you think I'm hammering Burr, I'm not, or at least I don't mean to. It is, however, impossible to write about him without picking up these small pieces, which appear in so many articles about him, and contrast them with what we've since learned about him. Raymond Burr is one of my favorite actors, just as Perry Mason remains one of my favorite series. And the comments from Burr's colleagues on Mason demonstrate why he was so well-liked on the set. He's a practical joker, for one thing, his favorite victim being Barbara Hale, who plays Mason's devoted secretary Della Street. He's good to the crew, with "a desire for everybody to be happy, to be wanted and to belong," leading one person to refer to the Mason set as "the happiest company in Hollywood." He's also loyal, and not afraid to fight for what he believes in. When William Talman, who plays Mason's nemesis Hamilton Burger, was suspended from the show following a morals charge (later dismissed), Burr was outraged and fought CBS constantly until Talman was reinstated. And Ray Collins, who plays Lt. Arthur Tragg, remained listed on the opening credits even after his health prevented him from appearing on the show. This was, of course, also at Burr's "request." This article is the first of a three-part series on Burr's life; subsequent parts will go into detail on the more dubious assertions about Burr's past. In later years, articles will elaborate on these events, but they'll also discuss Burr's devotion to visiting American troops in battle areas, and his continuing commitment to his colleagues. A mensch indeed. Here's an interesting little slice of life, airing live on Sunday afternoon on Channel 11 - the championship game of the State Catholic High School Basketball Tournament. * Yes, back in the day (and maybe still, in some areas) parochial high schools competed in their own tournaments, separate from that of the public schools. *Although, given the program's five-hour running time, I have to think Channel 11 was showing more than than one game. The reasons for this are numerous, and obvious, in 1961: private schools are able to attract students from a larger geographic area than the average high school*, giving them a "recruiting" advantage; Catholic schools are part of a culture that is, in general, less assimilated into the mainstream, etc. The differences between the Catholic tournament and the "real" tournament, played later in March, are there as well: the public school tournament is held in Williams Arena, home of the Minnesota Gophers and shrine of basketball in the state, before crowds that would rival those of contemporary NBA teams, with a Saturday night championship game viewed on statewide television; the Catholic tournament is held in the smaller St. Paul Auditorium and finishes on Sunday afternoon. *Nowadays, in many areas, students are free to enroll wherever they choose, which cuts down on the "recruiting" advantage. It's a small but telling example of how distinct the Catholic subculture was in 1961. I've read stories of dances at Catholic schools where teachers checked students for their baptismal certificates before letting them in, and Protestants who were warned they'd go straight to Hell if they stepped into a Catholic church. One of the major goals of the Second Vatican Council was to encourage ecumenism between faiths and assimilate Catholics into the greater culture; in other circumstances, this could be the jumping-off point for an entire discussion on the effects of the Vatican II vis-à-vis the current state of Catholic culture and practice (or lack thereof). I think we'll just let this speak for itself, though. 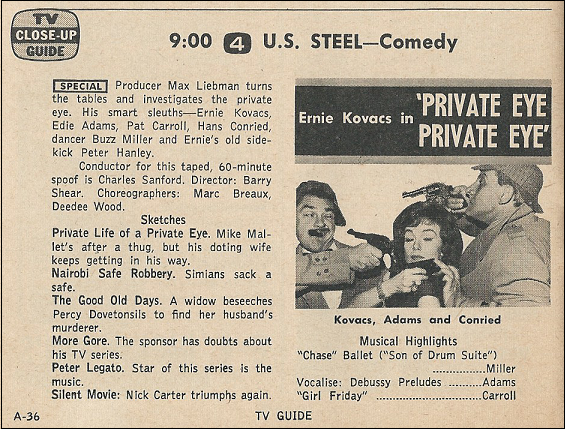 I've mentioned before that I'm a big fan of Ernie Kovacs, and this Wednesday Kovacs, along with his wife Edie Adams and a cast of nutty sidekicks including Hans Conried, Pat Carroll and Peter Hanley, appear on CBS' U.S. Steel Hour in the crime drama spoof "Private Eye, Private Eye." Given the description of the show (see below), I would have anticipated a very funny hour; however, a contemporary review labels it "pleasant but bland," a show that "tries very hard to be funnier than it is." It's true that Kovacs is an acquired taste, one that many people (critics included) often failed to get, but at the same time I can totally understand how the show might have underachieved. The reviewer comments that the most entertaining part of the show, in his opinion, is Kovacs' "attitude of perpetual boredom," which might well have been an indicator that he knew it wasn't working. On the other hand, it also could have been his acknowledgement of the absurdity of the situations he was portraying, such as a bit about a sponsor trying to bring some culture to his detective series. Oh well. The Play of the Week is one of David Susskind's projects, an attempt to recapture the magic of Golden Age television drama. It isn't a network drama, appearing instead on a syndicated lineup of 100 or so stations nationwide, from 1959 to 1961. (In the Twin Cities it's on independent Channel 9 on Wednesday at 8:30pm.) The quality of programming on Play of the Week is significant, and telling in comparison to that seen on TV today; the premiere episode was Euripides' "Medea" (with a translation by the poet Robinson Jeffers), and later productions were of works by authors as varied as Steinbeck, Sartre and Chekhov. This week's drama, "Legend of Lovers," is by playwright Jean Anouilh, whose play "Becket" will later be adapted into an Oscar-nominated movie starring Richard Burton and Peter O'Toole. 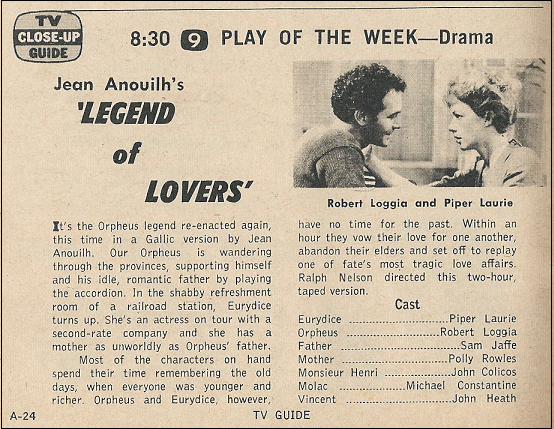 "Legend of Lovers" is an adaptation of the Greek tragedy of Orpheus and Eurydice, in this case updated to France in the 1930s, and stars Robert Loggia and Piper Laurie. Again, this is something I'd have a hard time imagining making it to television screens today. Its competition is The Barbara Stanwyck Show on NBC (followed by our favorite Jackpot Bowling Starring Milton Berle), and Peter Gunn on ABC. Continuing in the cultural vein, NBC's Omnibus on Sunday afternoon features another famous playwright, Pulitzer and Oscar winner William Saroyan*. Saroyan is on Omnibus to discuss the trend in theater toward the avant-garde, starting with an analysis of his own play "The Time of Your Life," both in its original version and in the avant-garde style, followed by performances from plays by Samuel Beckett, Eugene Ionesco and Edward Albee. With playwrights like that, I'd assume this show isn't a laugh riot. Probably not even as funny as "Private Eye, Private Eye." *Fun fact: William Saroyan's cousin is Ross Bagdasarian, Sr., whose stage name was David Seville. As in "Alvin and the Chipmunks" David Seville. And here's something you don't see often: a drama special on a weekday afternoon. It's "Mother and Daughter," an NBC Special For Women airing at 3:00pm CT on Thursday afternoon. It tells the story of a mother worried about her 16-year-daughter's growing independence, and the daughter's belief that her parents "wouldn't understand." It's got a heavy-hitting cast, with Patricia Neal and Arthur Hill as the parents, and Lynn Loring as the daughter. Just to show that this isn't a typical soap-opera story, NBC newswoman Pauline Frederick appears after the drama, interviewing New York City health commissioner Leona Baumgartner. Wait, we haven't covered the rest of the sports scene yet! Saturday's sports is pretty modest - no Wide World of Sports, no CBS Sports Spectacular, no PGA golf tournament. Channel 11, which has shown Missouri Valley Conference basketball all season, has Saint Louis taking on Bradley. NBC's NBA coverage continues with Syracuse vs. Philadelphia*, and CBS has an hour-long replay of an NFL game between Baltimore and Chicago from last season. Channel 4 follows that football up with a tape of last night's college hockey between North Dakota and Minnesota, bitter rivals then as now, and finishes up with the Big 10 basketball game of the week between Purdue and Illinois. *For those of you too young to remember, these are the Philadelphia Warriors, who at the end of the next season will move to San Francisco, leaving in Philadelphia a vacuum that will be filled the following season by the new 76ers, who used to be - the Syracuse Nationals. One of the things I enjoy about these early 60s games is the modesty of the arenas and stadiums in which the games take place, in the days before the arenas had become palaces. That Purdue-Illinois game, for example, is played at George Huff Gym on the Illinois campus. In checking, it turns out that Huff Gym was a formidable place for visiting teams to play in. The Illini have won 81% of the games they played at Huff, which they'll vacate in two years in favor of Assembly Hall, an arena that's newer, cleaner, bigger, and less charming. Huff held less than 7,000, which of course is the main reason it had to go, but the atmosphere in these small arenas, packed with students and filled with college spirit, is impossible to replicate. There are a few of the old buildings still around, but even one of the best, Williams Arena at the University of Minnesota, has been renovated to provide the modern conveniences, and while we should be grateful it's still around, it's still kind of sad to think of those that weren't, and the atmosphere that disappeared with them. Finally, the odd show of the week is on Friday evening at 7pm on KTCA, Channel 2, the educational station. There's no description of it, just the title: United World Federalists. Is anyone really surprised that a program like this would be on public television? Regarding the comments on the two state tournaments - in Wisconsin, the two associations didn't merge until the 1990s, and there are still some concerns. One of the main ones now is that small rural schools are in the same bracket as big-city private schools (both Catholic and Lutheran in Wisconsin), and the feeling is that a school that has 200 kids from a rural area can't compete with one that has 200 kids from a big-city (read: mostly black) area in basketball. So instead of religious concerns, it's switched to soft racial concerns, although it's also a matter of the city teams having a larger population to draw from for the same size school (read: recruiting). Thanks for the info, Ray. Good to have some more background. Your comment mechanism is a trifle wonky today, so this isn't really a reply as such; it's just what I was going to write about this issue anyway. I brought this issue to the office, together with several surrounding ones for context. - Chicago figures this week as Queen For A Day, which had just moved to ABC's daytime schedule, did the whole week from our fair city ("Da Grate City 'a' Chicaga" as Mayor Daley the First called it), Live from ... somewhere (probably a downtown hotel or theater - the State-Lake was in the same building as Channel 7, but I can't say for sure). - Jackie Gleason's talk show is winding down its CBS run on Friday, but he's got a guest star coup: Floyd Patterson and Ingemar Johansson, then taking turns as Heavyweight Champion - their next rematch was the following Monday in Miami Beach, conveniently for Gleason, who'd moved his show there for its final weeks. - The Play Of The Week aired here in Chicago on WGN-ch9, Mondays at 10:30, their regular late movie slot, with a repeat Fridays at the same time. In those pre-satellite days, syndicated shows were "bicycled" from station to station. "Legend of Lovers" played here a couple of weeks earlier; Minn-StPaul was a little farther down the timetable. This week, Chicago got "Back To Back", two one-act comedies by British barrister-turned-playwright John Mortimer. The first of the plays, "The Dock Brief", is famous as Mortimer's first pass at what eventually became Rumpole Of The Bailey. In repertory style, the same actors played in both plays: Michael Hordern, George Rose, Jean Marsh, and Leueen McGrath (George S. Kaufman's widow). - That US Steel Hour comedy special is a curiosity. Ernie Kovacs was still doing Take A Good Look for ABC on Thursdays (his "day job", so to speak), which makes me wonder why he'd be a hired hand for a Max Liebman production. Also, during this period, Liebman had been doing Steel Hour comedy specials headlining Sid Caesar; I'm guessing (possibly incorrectly) that this show was supposed to be one of those, but Caesar's personal problems might have gotten in the way. Kovacs was doing monthly specials for ABC and Dutch Masters Cigars at the time of his death, almost a year later. The Network and the cigar company filled out the contract with Kovacs's widow, Edie Adams - and Sid Caesar. - Big news story was Arthur Godfrey's ouster from Candid Camera, which I believe we might have touched on here a year ago. Godfrey and Allen Funt simply didn't get along, and so Durward Kirby took over the next season. That's enough for starters, I think. Good stuff as usual, Mike. It's interesting to get your perspective from another market, especially on the Play of the Week info. That John Mortimer double-header sounds interesting; nice cast as well. That is a good lineup on Gleason's show. Johansson was very visible on TV, wasn't he? Especially for a "foreign" champion. Reminds me, going off on a tangent, that during Jerry Lewis' short-lived two-hour show on ABC, I think he had Cassius Clay and Sonny Liston on prior to their first title fight, didn't he? Or am I remembering something else? Good pickup on the oddity of Kovacs on CBS and working for LIebman. I'd think your speculation about Sid Caesar might be right; would be interesting to go back and read the TV Teletypes from the past few months and see if there'd been anything about another upcoming US Steel special with Caesar. To me, Ernie Kovacs was the first guy to grasp the technonoly of TV and harness that for coverage. He wasn't above using a pie to the face, though. Berle could be funny but used the TV studio as a stage, he was doing the same sort of jokes and humor thirty years earlier in Vaudville. Kovacs was always trying something new, often falling flat but heavens, he was a visionary. Preaching to the choir perhaps, but it's a great choir to be a member of, isn't it? You're right that not everything he did worked, but so much of it is just as fresh now as it was then. The 5 hours of the Catholic Basketball tournament likely included 2 if not 3 games. Those would have been the consolation championship(5th place) 3rd place and championship games. You can get 3 high school basketball games into a 5 hour window with the time between games included. I just discovered your website & I have enjoyed going through the TV Guide entries. Anyway, I would like to point out that Ernie Kovacs' "Private Eye, Private Eye" finally came out on DVD last year as a supplement to the TAGL box set. Frankly, it wasn't as good as his specials, but it was all right.